Joy and stress seem to go hand in hand during the holidays as we travel, host, cook, and party. The chaos associated with visits and visitors can stress out your pet too! So don’t wait til a problem arises – with minimal planning both you and your pet can relax and enjoy the holiday. The commotion of having visitors – ringing doorbells, people in and out, crowded rooms, and busy kitchens – may rattle your dog. Follow these three steps to keep him calm. Step 1. Before guests arrive, drain your dog’s energy with a long walk or a long game of fetch. Get the kids to help. Step 2. Create a safe haven for the dog where she can get a break from the hustle and bustle. Set up her bed, food and water in a room she can retreat to when needed for food or rest. Make sure this room is off limits to guests, especially children, so the dog really knows this is a safe and quiet place. Step 3. If your dog shows signs of stress around visitors (hyperactivity, pacing, barking, whining), it might be wise to put him in a room or crate for a while. 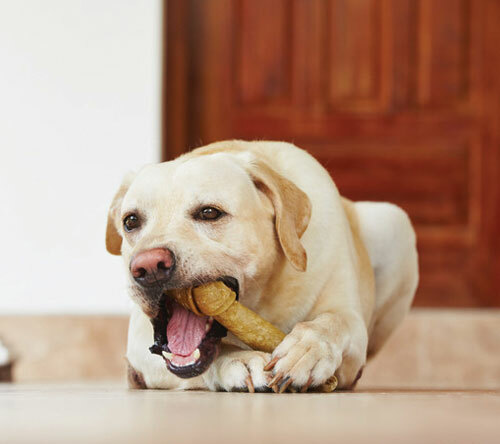 Give him something to do – a bone to chew, a treat in a kong – to help him enjoy himself. And remember to provide exercise and potty breaks. If you’re planning on taking your dog while visiting someone, first clear it with your host. Even dog lovers may find another person’s pet in the home an imposition during this hectic time. If your host agrees, bring a crate for your dog so she has a safe place to relax and you have a place to put her if needed (see signs of stress above). Bring a blanket or bed from home for comfort as well as an activity, such as a food toy or a kong. Ensure your pet is up to date on vaccines, especially Bordetella, in case you need to kennel him at the last minute. If you are travelling and not taking your dog, book your kennel or dog sitter well in advance. High quality care providers fill up quickly. Your dog needs to be vaccinated at least three weeks before you leave. Leave an emergency contact for someone you trust to make medical treatment decisions while you are away. Let your vet know of this arrangement in writing, which will help expedite things in case of an emergency. Select a care provider or kennel that is insured and knowledgeable. Get references and ask for a tour of the grounds. Expect to see a reasonable level of cleanliness and organization – cages should carry labels with each dog’s name, special needs, food, and medicine. Ask the kennel how off leash play is arranged – some thought and consideration should be given to which dogs play together (e.g., puppies with puppies, separated by size). Enjoy your holiday with your pet. And tell Santa Paws to leave a special something for him or her under the tree. Michelle Black is a dog trainer and owner of PAWSitively Happy Home; www.pawsitivelyhappyhome.com.